BONN -- A wave of "Queen fever" is sweeping West Germany amid frantic preparations for Queen Elizabeth's state visit in two weeks' time. West Germans are rehearsing salutes, repairing roads, painting buildings, turning out Union Jacks and brushing up etiquette with an enthusiasm to match their national thoroughness. When the Queen  arrives with Prince Philip  for her 10-day visit, she may receive the most tremendous welcome this young state has ever given a foreign visitor. The accompanying press corps -- about 300 strong -- is half as large again as that which covered the historic visits of presidents Kennedy and de Gaulle. For weeks newspapers, magazines and television have been making sure that the public knows all about the British monarchy, the Queen's life, her likes and dislikes, her family and, inevitably, the "truth" about her "as she really is." A public opinion poll has announced she is immensely popular with West Germans. Two out of three said they liked her -- an unusually large number for a public figure. Only six percent were against her and the rest were indifferent. A wave of nostalgia has swept over this sober 15-year-old republic for the vanished courts and royal houses of Germany. The prospect of unfamiliar royal protocol has produced a flutter of anxiety -- particularly among women -- about what to do, wear and say, if they are confronted with the Queen. Newspapers and dancing teachers have been giving instructions on etiquette: do not speak until spoken to, address her as "Your Majesty," curtsy if you wish, but on no account kiss the Queen's hand. Dancing schools have been demonstrating the intricacies of the "court curtsy" and clothes rental firms report that "tails" are now almost impossible to come by. Planners of the visit have worked hard to overcome the lack of a real national capital. for the main reception the government is borrowing the magnificent 18th century castle of Bruhl , between here and Cologne. In Bonn, the federal capital, only the Petersburg hotel overlooking the Rhine was found suitable for the royal suite. From here the Queen will see the river illuminated by a gigantic fireworks display. During her tour of 10 German cities, the Queen will sleep in the special royal train which will carry her most of the time. 1. Queen Elizabeth II of the United Kingdom (born 1926) is the current sovereign of the United Kingdom and the Commonwealth realms. She's the only living head of state who served in World War II. 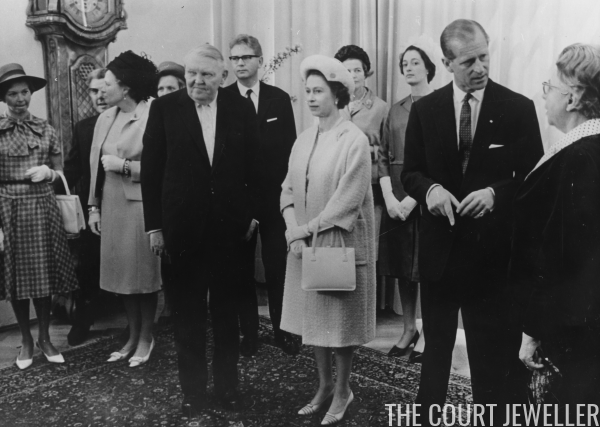 This state visit, which took place in West Germany and West Berlin, was the Queen's first official visit to the country. It took place in the midst of the Cold War, not even two decades after the end of World War II. She also visited West Germany in 1978 and 1987; after unification, she made visits to Germany in 1990, 1992, 2004, and 2015. 2. Prince Philip, Duke of Edinburgh (born 1921) has been married to Queen Elizabeth II for nearly seven decades. 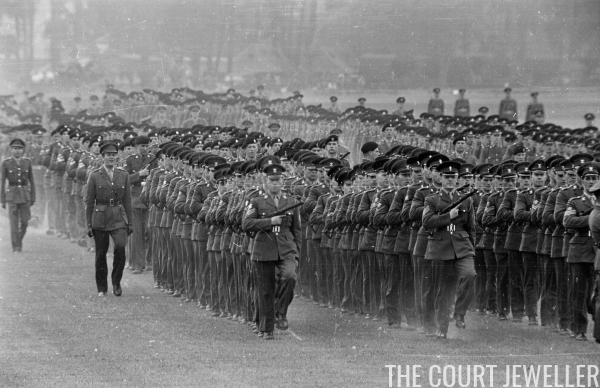 Although he was the son of a Greek prince and a German princess, Philip served in the Royal Navy during World War II. He was mentioned in despatches for his valor during the Battle of Cape Matapan. Philip's relationship with Germany was complicated. He was educated for a time in Baden-Württemberg, a large part of his mother's family came from Germany, and all of his sisters married German princes. These relationships led to some particularly difficult moments for Philip, whose loyalty to Britain had sometimes been challenged (reportedly even at one point by the Queen Mother) because of his family and his past. Two of his brothers-in-law, Christoph of Hesse and Berthold of Baden, fought on the opposite side during the war. When his sister Cecilie and her family died in a plane crash in 1937, Philip was pictured alongside relatives in Nazi uniforms at her funeral in Germany. This state visit must have been a particularly complicated one for Philip as well as the Queen. 3. Schloss Augustusburg is part of a complex of historical buildings in Brühl. The palace was built in the 18th century by Clemens August of Bavaria (1700-1761), the Archbishop-Elector of Cologne. The grounds also include a large hunting lodge, Falkenlust, and extensive gardens. Because of its proximity to Bonn, Augustusburg was frequently used for government receptions until unification in the 1990s. Today, the entire complex is a UNESCO World Heritage Site.